OAKLAND, Calif. (CNS) — Jasmine Munoz could have met Mickey Mouse at Disneyland, gone to a beach or taken a cruise, but the 12-year-old leukemia survivor would rather see the Vatican and meet Pope Francis. Thanks to the Make-A-Wish Foundation, a nonprofit organization dedicated to granting the wishes of children with serious diseases, Jasmine’s dream will come true. She and her family will travel to Rome April 11-19. After Jasmine entered the hospital, a social worker told the family about the Make-A-Wish Foundation. Jasmine said she wanted to see Rome and the Vatican. Everyone was surprised by the choice. Jasmine added, “I chose Rome because I like Europe — the language, the food, the churches and the history.” And although it was not possible to obtain a private audience with the pope, Jasmine will be present at a public audience. The Make-A-Wish Foundation grants the wishes of children with life-threatening medical conditions. The process starts with a wish referral. Referrals come from parents, doctors, social workers and others who know about a child living with medical problems, said Jen Wilson, marketing director at the Make-A-Wish Greater Bay Area chapter. Last year, the chapter received 413 referrals, and 262 of them were granted. The most common wish is a trip to Disneyland, Disney World or a Disney cruise. The last child to wish for a meeting with the pope was in 2010. And that child did get to meet the pope. Make-A-Wish picks up all the costs of someone’s wish. If that wish involves travel costs like transportation and accommodations Make-A-Wish gets by with the help of many donors. In addition to financial contributions from individuals, corporations, clubs and other groups, in-kind contributions of goods or services play a big role. Jasmine was diagnosed with leukemia in May 2011. What started as a stomachache ended with the news she had cancer of the blood. Her family, who lived in Oakley, was living in Mexico for a year where Jasmine and her sisters, Isabela, 6, and Camila, 4, could learn Spanish. It was while living there that the girls’ parents, Norma and Ignacio Munoz, found out about Jasmine’s illness. They came back to California immediately, going directly from the airport to Kaiser Hospital in Oakland, where treatment began. Jasmine underwent chemotherapy, but it did not work. Neither did an experimental procedure. More chemotherapy reduced her body’s defenses and she developed pneumonia and suffered a heart attack. She spent two months in intensive care connected to a ventilator. “The doctors told us that all we could do was pray,” recalled Norma Munoz. “We were inconsolable. In these difficult times I felt close to God and came an indescribable peace. 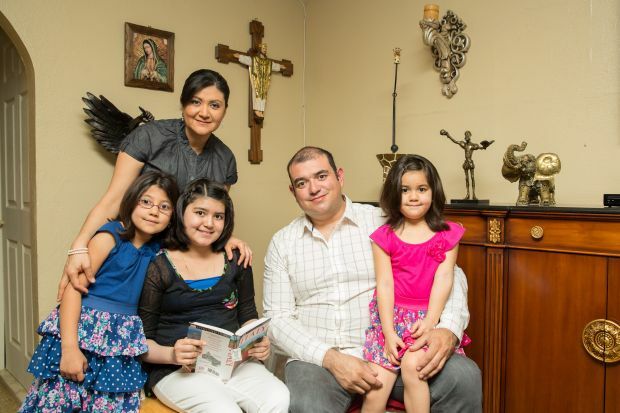 I stopped mourning and I felt very comfortable knowing that everything would be fine,” said Ignacio Munoz, adding he had not been close to the church. Jasmine developed a serious infection, and was transferred to University of California San Francisco Medical Center, where she underwent more surgery. “Doctors, nurses and everyone at home was surprised by Jasmine’s strength,” her mother said. Doctors suggested the family try a bone marrow transplant. “It was a tough decision, very risky, very scary because we did not know if Jasmine was going to survive. But it was a sign from God that my second daughter, Isabela, was a 100 percent compatible donor,” said Norma. The bone marrow transplant went well. Jasmine recovered from the procedure in four weeks. At her last exam, Jasmine was doing well. “We’re very close,” said Norma Munoz, who claims to have seen many miracles in the recovery of her daughter, who was on the brink of death on several occasions. During the illness, the family moved to Hayward to be near in-laws, and started attending St. Joachim Church. “It changed our lives. We have come very close to God. Jasmine is reading the life of St. Teresa,” Norma Munoz said. Norma became a reader at St. Joachim and Jasmine is part of the choir. It turns out there’s another papal connection at the parish. St. Joachim’s parochial vicar, Divine Word Father Mario Olea, worked with a Catholic television station in Buenos Aires, Argentina, in the early 2000s, when Pope Francis, then Cardinal Jorge Bergoglio, was archbishop there. Aguirre is a staff writer for The Catholic Voice, Oakland’s diocesan newspaper. Contributing to this story was staff writer Carrie McClish.